Friday 11:15 a.m. - 12:15 p.m. and 12:20 - 1:20 p.m. Learn How to create the perfect hairstyle to complement Gene's favorite ensemble! Rick will demonstrate the steps involved in achieving that perfect Movie Star look! Please bring a Gene with long hair, small comb, round needle nose pliers, and water bottle. Friday 11:15 a.m. - 12:15 p.m. and Saturday 3:30 - 4:30 p.m.
George Sarofeen, designer of the 2002 DOTY-award winning Presidential Ball, will demonstrate simple beading techniques in this class. Participants will also learn how to make the simple beading pattern which has been seen on a Sarofeen design for Madra, "Anything But Nice." Needles, thread, fabric swatches and beads will be provided. Participants will need to bring small sharp scissors, a needle threader, a 7-8" embroidery hoop, and, if you have one, a needlework magnifier of some sort. Attendees will assemble a Gene-sized mannequin, decorate, and embellish it for an attractive, affordable display of outfits when you've run out of dolls to put them on! Students should bring a pair of scissors and a sense of humor. Friday 12:20 - 1:20 p.m. and Sat 3:30 - 4:30 p.m.
What do Joan Crawford and Gene Marshall have in common? No wire hangers! In this workshop we will make fabric covered hangers for Gene's one and two piece outfits. Please bring scissors. Friday 12:20 - 1:20 p.m. and Saturday 2:25 - 3:25 p.m. HATS HATS HATS...Kathy Moreau from Paris, France, who runs the Paris Fashion Doll Festival, also studied fashion design and millinery in Paris. 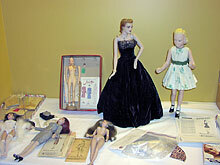 She has been making hats for fashion dolls as a hobby for many years. Her hats and patterns have appeared in many magazines in Europe and in Barbie Bazaar & Haute Doll magazines in the USA. She has taught many hat workshops in Europe, U.S.A. and in Canada. In her ‘hands on’ workshop, Kathy Moreau will teach how to make many styles of straw hats for your fashion dolls from Vintage to Philip Treacy inspired contemporary hats. All participants will take home a hat for their GENE fashion doll. Supplied, per person, will be a miniature hat straw, needle, thread , decorative accessories and photocopied instructions to make many different models at home after the workshop. No previous millinery experience is necessary. Participants need to bring scissors & note pad and pen plus Gene doll (optional). Saturday 12:15 - 1:15 p.m. and 1:20 - 2:20 p.m.
Marcia Friend of "Facets by Marcia," will teach the basics of working with beads on twisted wire to make delicate jewelry designs for your dolls. Please bring needle nose pliers and wire cutters. Marie Migliaro of “Dreamgirls? will reveal how she does the scenes for "Meet the Maxwells," her popular online soap opera. She will demonstrate how she creates furniture from things around the house, how to set a scene and pose the dolls, and other tricks of setting a stage! Tired of searching for the perfect fabric? Print it yourself! We will be creating our own fabric sheets for use in your computer's printer. We will also compare many of the available brands, with attention to price, texture, colorfastness etc. If time and interest permit, we will also chat about creating transfers. As part of our discussion, we will talk about scale, fiber choice and basic computer principles as needed (scanning, image reversal for transfers etc.) We'll use Photoshop CS but principles are similar across software. Be sure to make note of your software at home so you can compare notes with other attendees. Please bring one 9 x 12 piece of plain 100% cotton or 100% silk for the creation of your own printer sheet. If necessary, I will have a limited number of extra pieces of fabric available for $1 each. Saturday 12:15 - 1:15 p.m. and 2:25 - 3:25 p.m.
Come learn the basics of ribbon embroidery! This workshop will show beginning crafters the basics of ribbon embroidery—we will practice 3 basic flower and leaf designs and put them into practice on an easy accessory you can finish in the workshop. No crafting or sewing experience necessary. Bring along scissors, everything else will be provided, along with a handout containing ideas for using ribbon work on Gene's wardrobe. Saturday 1:20 - 2:20 p.m. and 2:25 - 3:25 p.m. Looking to give your designs that one, two, three punch? Clea Bella doll designer Christina "Bogie" Bougas shares with collectors some of her design secrets, including insights into quick sketching, design and color. Students should bring pencils, tracing paper, scissors and erasers. Bogie will be providing students with sketch models and handouts. Saturday 2:25 - 3:25 p.m.
Join Pat Henry, the publisher of FDQ: Fashion Doll Quarterly, as she guides you through some basic and intermediate steps to take the best digital photos for your website and for print. Learn how to build an inexpensive set that looks like the real thing, and get acquainted with the powerful tools of Photoshop as well. Secrets of Using Photoshop in Digital Photography with Pat Henry Saturday 3:30 - 4:30 p.m.
Would you like Gene to visit Paris? Have Madra in a scene with Clark Gable? Now you can learn some of the most popular techniques to create "photo-illustrations" using Photoshop. Pat Henry, publisher of FDQ: Fashion Doll Quarterly, will show you how to take the best shots of your dolls, and create different backdrops, change their make-up, and improve the quality of your photos for print or the Internet. Please do not sign up if you are not registered for convention. Demonstrations and workshops will be filled on a first-come, first-served basis. Space is limited. You must be present to receive your workshop kit. We reserve the right to combine classes if there are not enough participants in each session. All times subject to change. When traveling to convention, you should not pack pliers, wire, or shears of any size in carry on bags - these need to be packed away in checked luggage and they still might be removed - especially wire and pliers together. There is a Target and a Michael's very close to the convention hotel (Michael's is within walking distance). Please select up to but not more than three workshops from the table below. 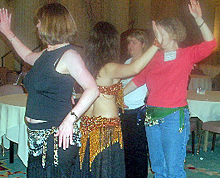 You may indicate second and third choices in case one or more of your first-choice workshops becomes filled. 3rd choice 1, 2, 3, Punch!